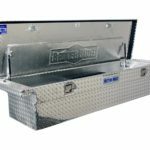 When searching for a truck bed tool box, there’s no doubt you’ve come across a Better Built Tool Box. 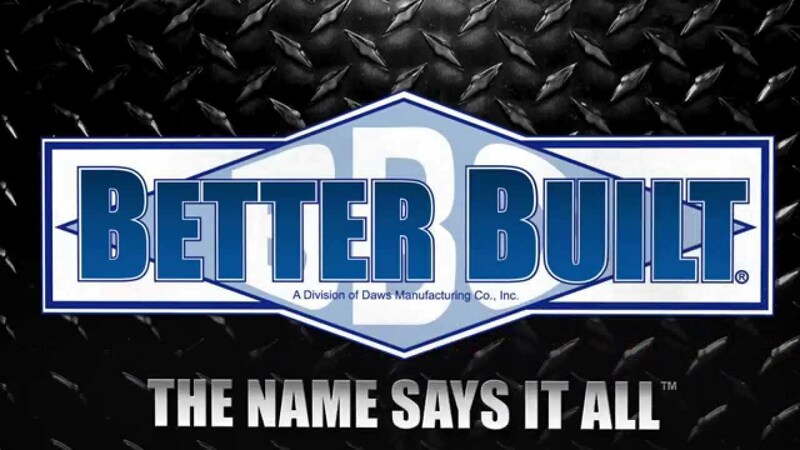 BetterBuilt has been in the business for over two decades, and as a result you will see them everywhere. 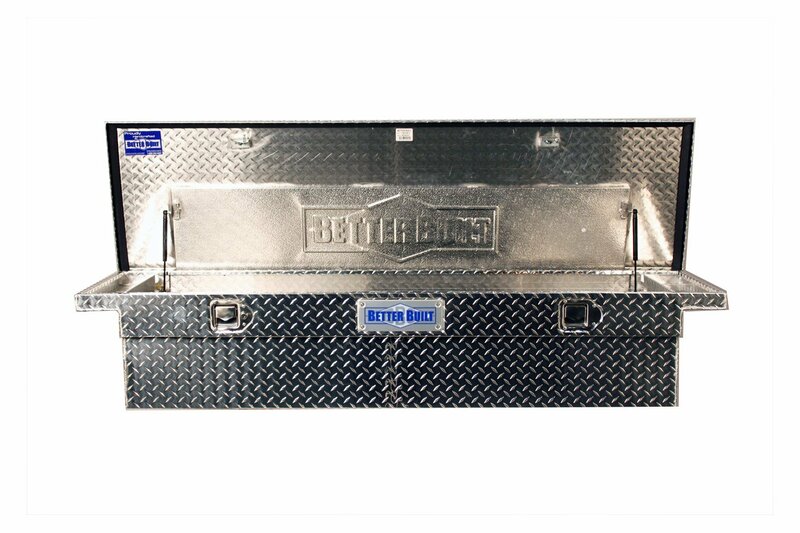 The main draw to buying a BetterBuilt is the fact that they make affordable aluminum boxes for your trucks, with good quality materials. There are several different styles to choose from (read this if you need a refresher on truck box styles) and today, we’re going to review each one of them to see which one is best for you and your truck. We did all the research for you, and compiled it into this nifty comparison chart. If you want to get into detail about each one, then check out the full reviews below! 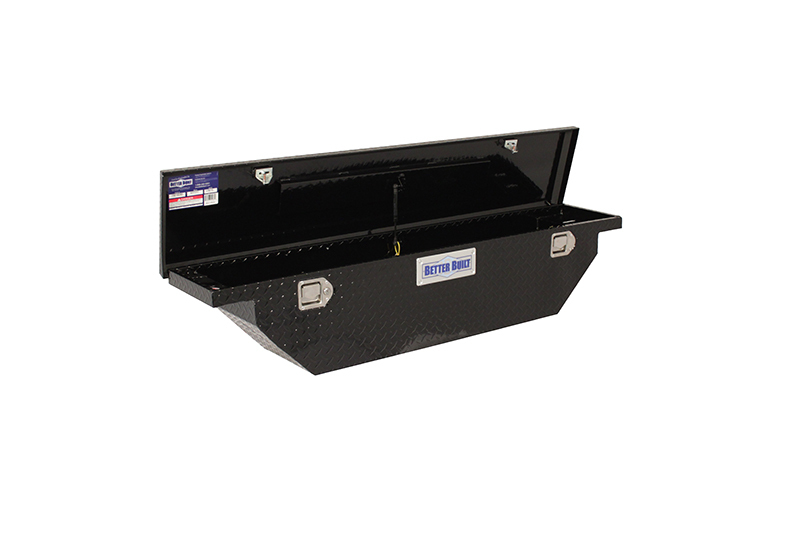 This Crown Series Crossover tool box is Better Built’s best seller. 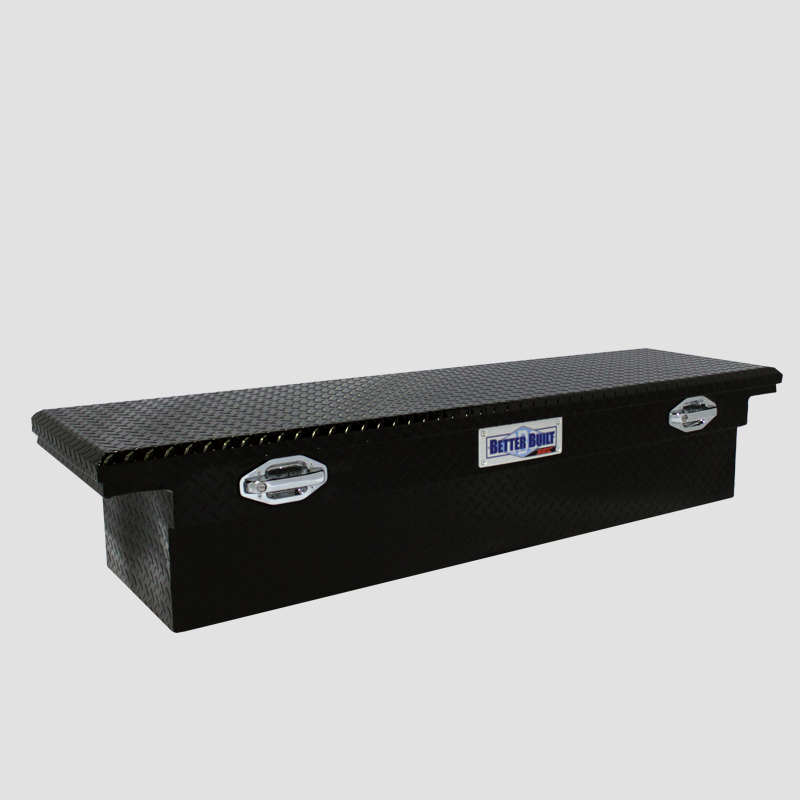 It is a crossover style, meaning it rests on the bed rails of your truck bed and crosses the gap of the bed. However, it is designed to fit full-sized trucks like Silverados, Sierras, and Tundras. It won’t fit a smaller truck like a Ford Ranger. You can check out if your truck will be compatible here by inputting your make, model and trim. It has a single lid with two hinges, which have a “auto-lift” feature that make it easy to open. The thin lid makes it a great low profile box that provides a clear view through the back window of your rig. A 5 pocket plastic tray is included to help you keep smaller items organized in the box. The patented “integral end” of the box (the part that hangs over the bed) is made of a solid piece of metal that gives strength and also provides a small storage area. 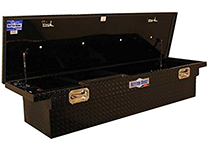 This tool chest is made from corrosion-resistant diamond plate aluminum. The diamond plate aluminum not only looks great, but if you ever have to stand on the box for any reason, you won’t slip. And, the lid should support you with it’s reinforced brace. The body is one solid piece of aluminum, and the box has 100% fully welded seams providing strength and durability. The continuous aluminum piano hinge opens and closes smoothly. 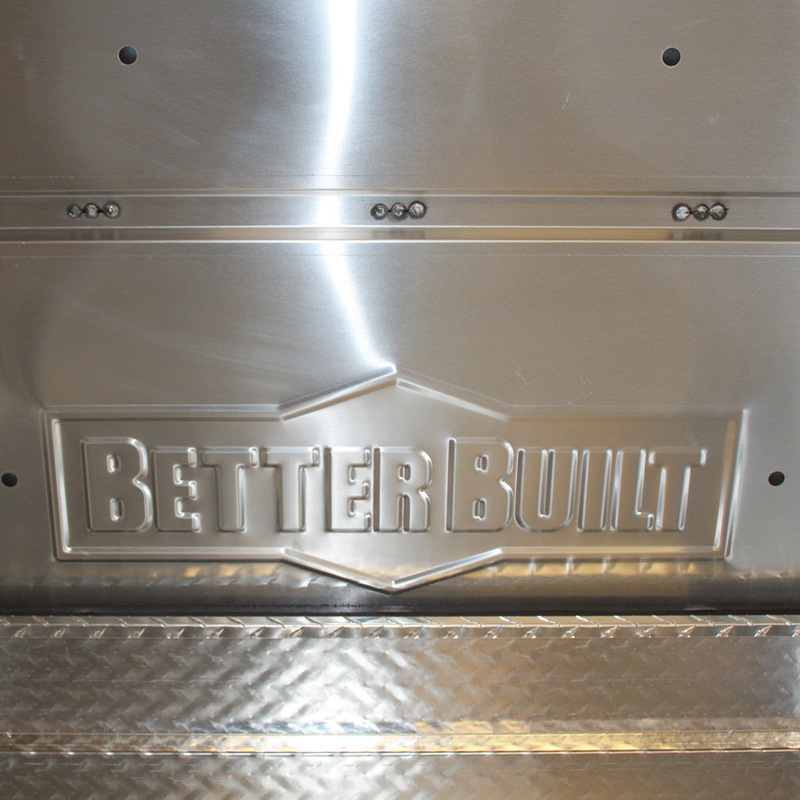 The smooth finished edges and shiny aluminum finish will look great in the back of any truck. There are two secure lockable latches that keep your tools safe from theft. And the way the box mounts to your truck will prevent anyone from just coming along and taking the entire box (if they could even lift it with all your tools inside). The inside of the paddle laches also have what Better Built calls an “up and over” rod, which makes it possible to open the box with one hand – great so that you don’t have to hop in the bed of your truck when you need a certain tool. The lid features black rubber weather stripping that when closed, seals out water and dust keeping your tools dry and clean. 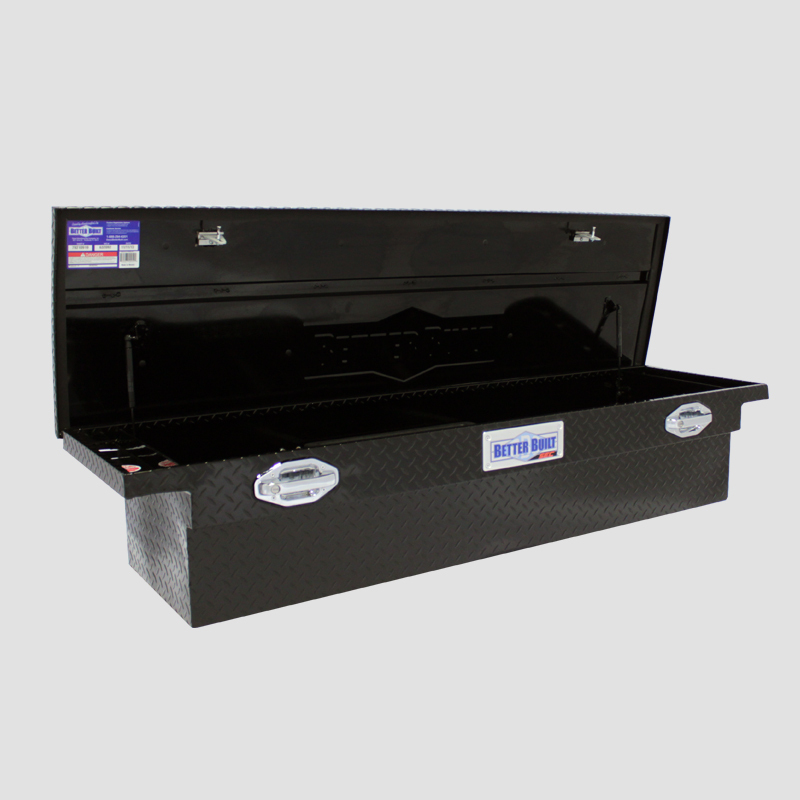 The Crown Series Crossover tool box is designed to fit full-sized trucks. The measurements of this box can be seen below. You should always double check the measurements of your truck bed when buying to be sure it will fit. Installation is easy and like most crossover tool boxes. 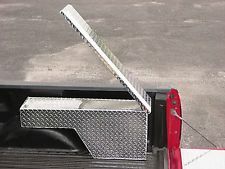 The extended edge of the box rests on the truck bed, while J-hooks hook underneath the bed rail and up into the extended edge. Then, you simply fasten it tight. This BetterBuilt is a great option for most folks with full-sized trucks. It has a low profile, and shiny aluminum diamond plate finish that looks awesome. 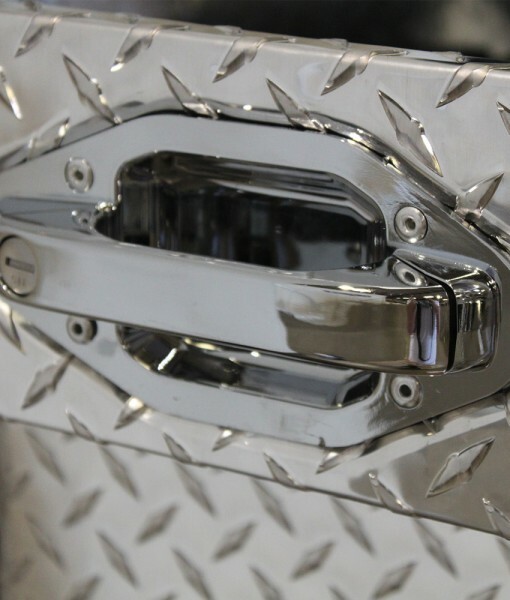 The latches are solid, and the hinges work well and make it easy to open with one hand at the side of your truck. The aluminum is sturdy, though likely not the same quality as you may get with a WeatherGuard, Delta or Jobox. These premium boxes come at a cost, however. But for those shopping on a budget, it will definitely do the job at a lower price, while sacrificing a little bit of quality. This crossover model is similar to the Crown edition above, but with a few upgrades. 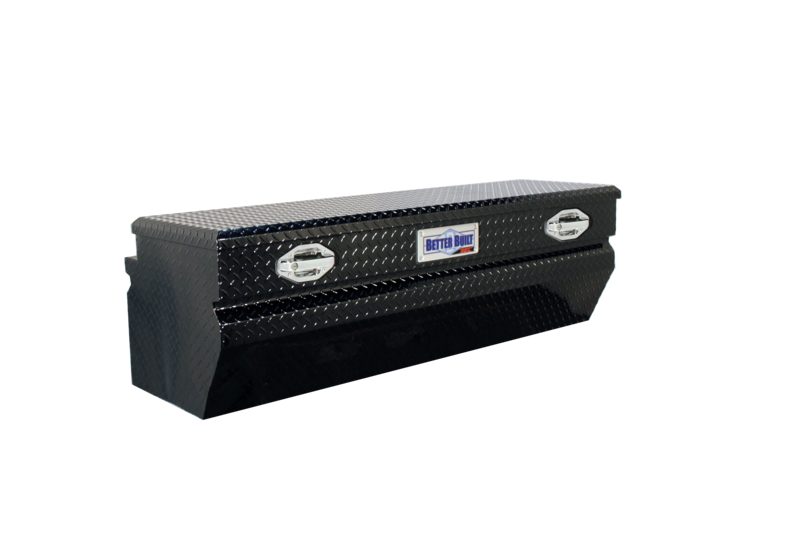 This Special Crown Edition toolbox also has a single, reinforced lid. This lid however, is reinforced with foam on the interior. This provides extra strength without adding a large amount of unnecessary weight. The lid is thin and maintains a low profile, great for rear visibility. This BetterBuilt also features a 5 pocket plastic tray to help keep smaller items organized. The same auto-lift shocks help open the lid, making it possible to open with one hand, form the side of your truck. The “integral end” provides strength and an extra storage space. 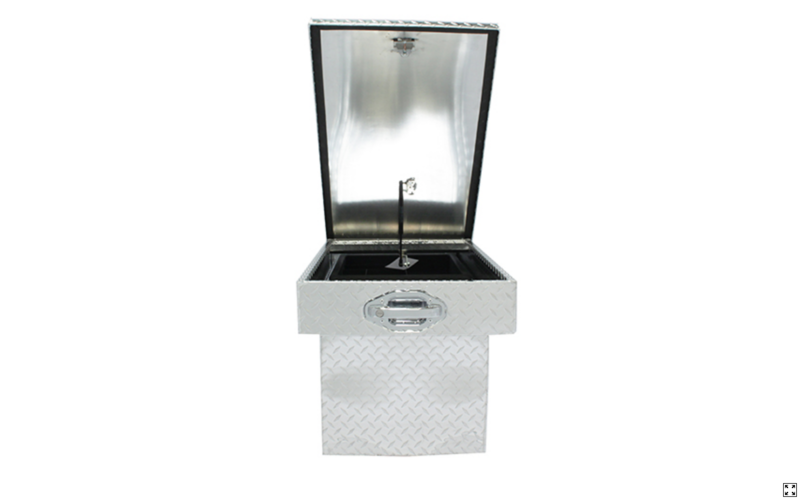 The container is composed of 100% rust resistant aluminum, with a diamond tread plate exterior. The exterior looks rugged, and provides grip if you ever need to stand or rest something on the box. It is finished in a black powder coat finish, that looks super sleek and will look great on all trucks. The seams are fully sealed and welded with care. The aluminum piano hinge is smooth when opening and closing. One noticeable improvement that was made in this Special Crown Edition over the Crown Series, is the improvement of the boxes latches and handles. 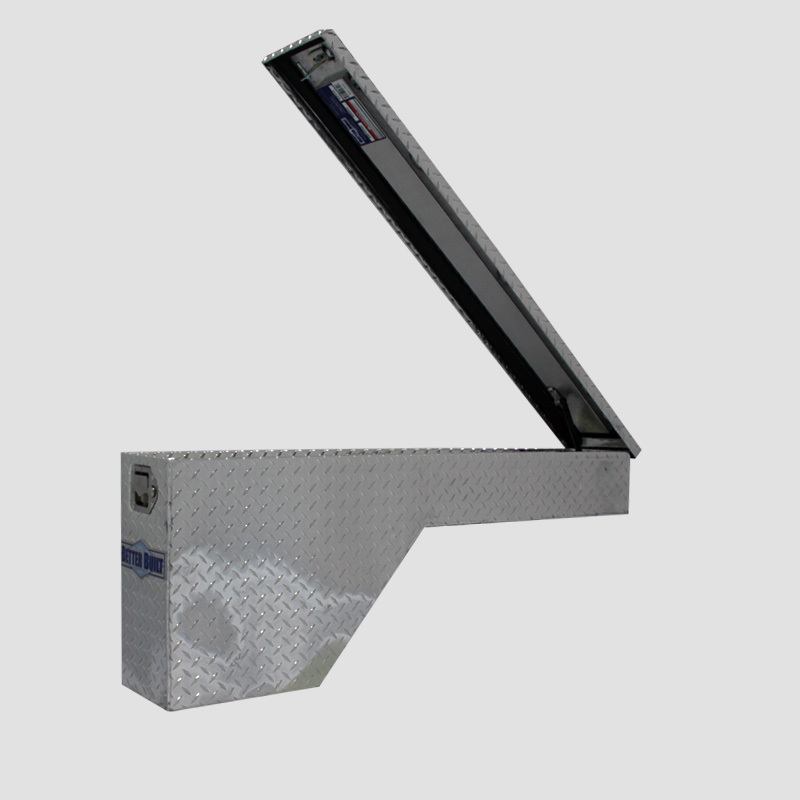 Instead of a simple, light paddle hatch, this box features stainless steel, lockable pull hatches with a full handle. The 2-stage automotive grade rotary locks provide maximum security. It also has the “up and over” rod allowing you to open the box with one hand. A strip of rubber weatherproofing spans the exterior of the lid, protecting the inside of the box (and your tools) from rain, snow, sand and dust. This is another full-sized truck box, spanning 70 inches across. So make sure you know the size of your truck or input your truck’s make and model to be sure. The full measurements can be seen below. Installation for these crossover boxes is easy, using simple J-hooks to attach the box to your bed rails and simply laying the box across your truck bed. The most noticeable differences in this Special Crown Edition compared to the model reviewed above, is the improvement in the handle and latch design, as well as better locks. Although you’ll pay a bit more, you’re paying for more security. As well, the black finish looks unreal on almost every truck. 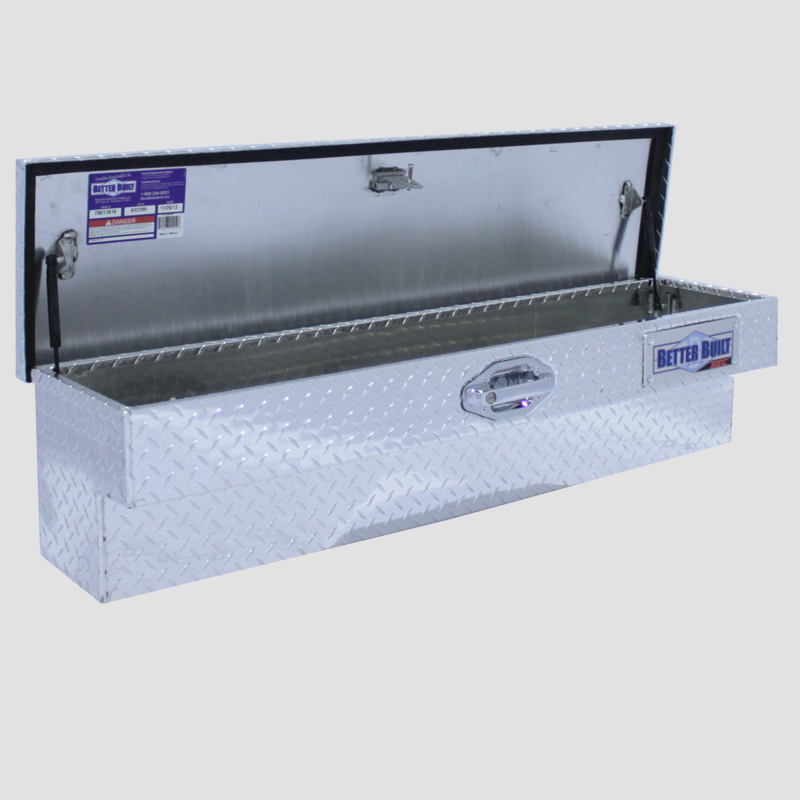 This is another great affordable option for a full-sized aluminum truck tool box. This BetterBuilt is the first on this list that is suitable for mid sized trucks. 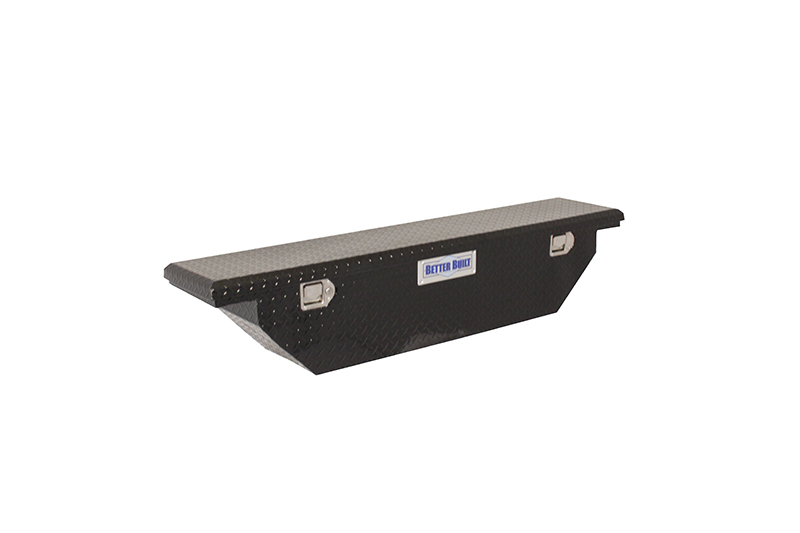 It is a crossover style, mounting to the truck by sitting on the bed rails and being fastened tight. This storage container features a slim design, taking up only 12 inches of space in your truck bed, although this does cut back on your storage space. The lid is thin, but reinforced with a brace, and made of aluminum. 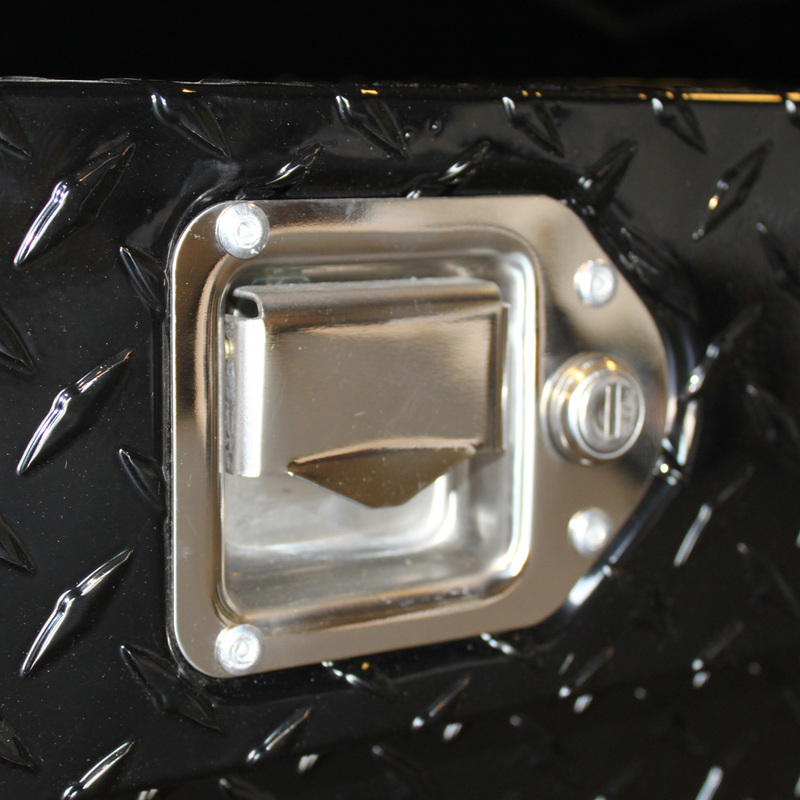 The lid keeps a low profile, which is crucial in smaller trucks to provide good visibility out of the rear window. It comes with the small tray to organize smaller tools and materials. It is in a wedge shape, which functions to fit in trucks with wheel wells that would otherwise inhibit the mounting of a box – which you often see in mid sized trucks. As expected, this wedged box is constructed of 100% aluminum. Welds are clean and solid, and the edges are smooth and finished. It is made of the classic diamond plate aluminum, and it has the black powder coat covering it. The powder coat is just for looks, since aluminum is rust-resistant, but darn if it doesn’t look good! The handles of this BetterBuilt are the paddle handles, with a lock mounted beside. The latches are easy to open, and provide security, keeping your tools safe from theft. Only the driver’s side paddle latch locks, however. This box features the same “up and over” rod and auto-lift shocks that are in the other boxes that make it easy and effortless to access, even with one hand. Rubber weatherproofing strips cover the interior edge of the lid, acting to seal out water, dust and other damaging weather products. This wedge-shaped container is smaller than the two previous models, spanning 61.5 inches in length. The length, paired with the wedge shape and slim body makes it an ideal choice for those who own mid-sized trucks. Make sure you double check the measurements of your truck bed before ordering though to make sure! You can check out the exact measurements of the box below. 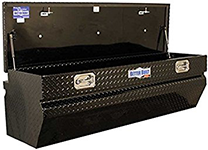 This tool box is awesome for those in mid-sized and compact trucks. The lid is easy to open, from either side of your truck and even with one hand. The aluminum is sturdy, but lightweight, and the black powder coat finish looks super good, and will look great on any truck. It has a low profile so your view out the back window isn’t inhibited, and the wedge shape and narrow fit make it perfect for smaller trucks. The paddle handles open easily, and the locks are solid, keeping your tools safe. The lid is reinforced for strength and water tight keeping water out of the box and your tools rust-free. This BetterBuilt is a must have for trucks it will fit in! 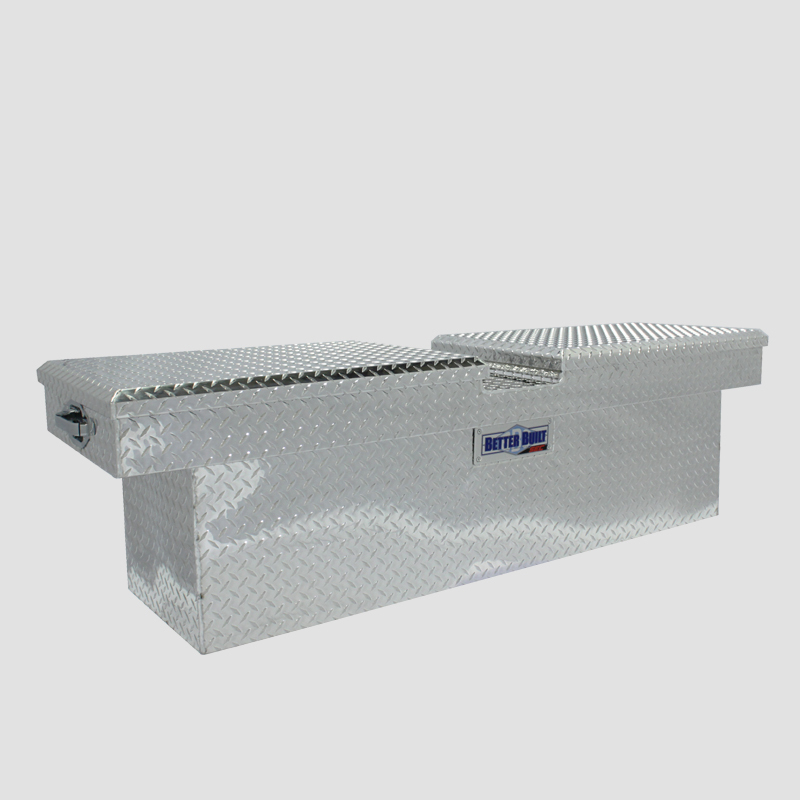 Similar to the previous boxes we have covered, this tool box is a crossover style, which spans the width of your truck bed. However, it differs significantly in the way you can access your tools. This is a gullwing style model. The two lids open towards the center of the box, rather than just a single hinged lid. Some folks greatly prefer a gullwing style box because of the ease in accessing tools from the side of the truck. You don’t need to get into the bed of the truck to get at larger, heavier tools. You just need to remember what tools are at what side! The same plastic tray used to organize smaller tools is included with this box as well. This tool box is available in an unfinished shiny aluminum material. It’s not necessary to powder coat aluminum because it is rust-resistant and won’t corrode if left unfinished. You just get a shiny metallic exterior instead of a matte black finish, which looks just as good in our opinion. 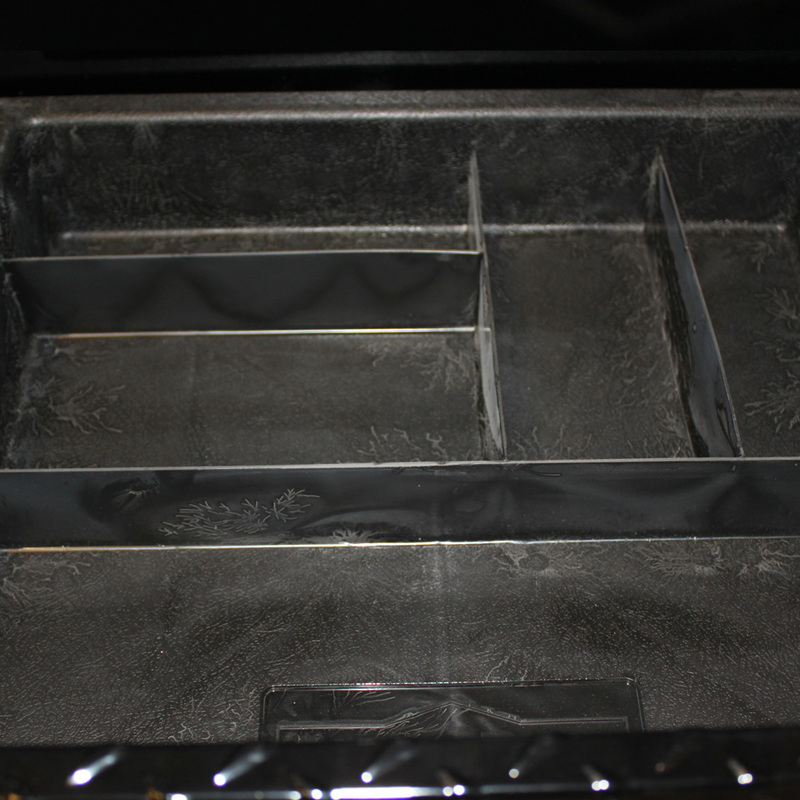 This box is made of 100% aluminum, with clean edges and quality welds. The integral solid metal end that mounts on the bed rails gives strength to the box, and provides a small storage space. Like the other Special Edition Crown box we covered earlier, the aluminum lid is reinforced with foam, providing durability without the cost of too much excess weight. This model also features the Special Crown Edition pull handles on each lid, with 2-stage automotive grade rotary latches which provide excellent security to your tools. These stainless steel pull handles are higher quality than other paddle style handles. A single auto-lift shock is mounted on each lid making opening the box and getting at your tools effortless. This gullwing style container doesn’t have quite the low profile as some of the other BetterBuilt boxes we’ve covered so far, and has quite a deep tub (20 inches total height). However, you still have plenty of room to see out the back window. Installation is the same as any crossover style, mounting and fastening the box to the bed rails with a J-hook or other mounting accessory. You can check out the exact measurements below. If you are going to be in and out of your tool chest all day, then a gullwing style might be the right fit for your truck. 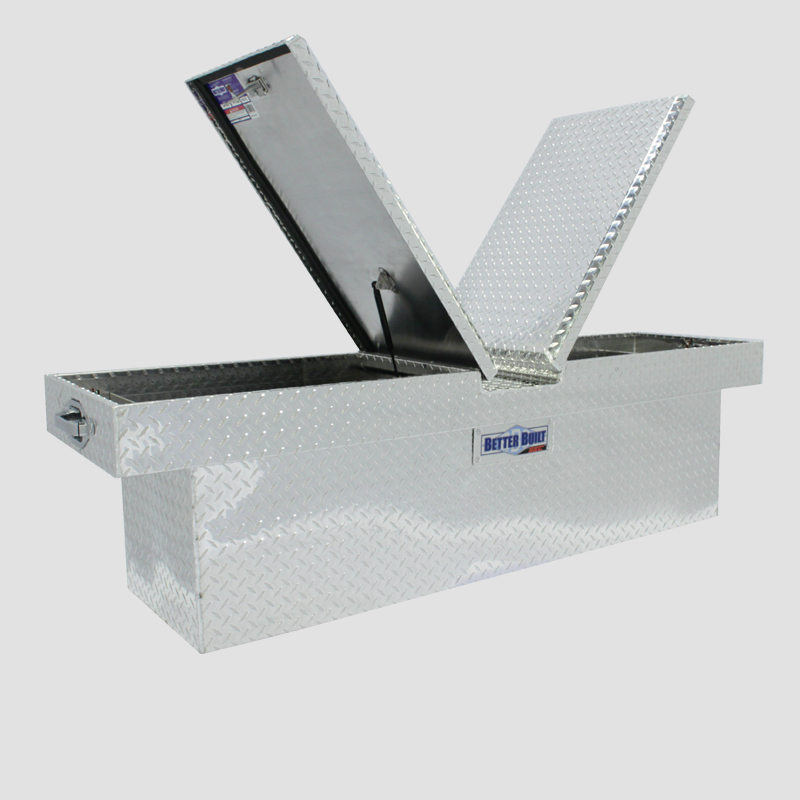 Having a lid that is easy to open mounted on either side of your truck makes it much easier to access your tools without hopping in the bed of your truck. Of course, you’ll just have to remember what side the tools you need are on! 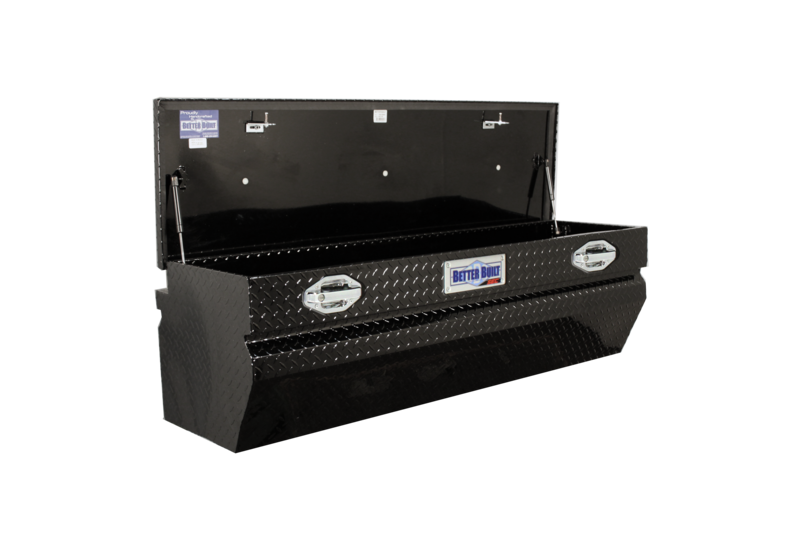 Double check the height of your truck bed, since this deep tub box may rest on the bottom of your bed, reducing more space of your bed than other shorter models. 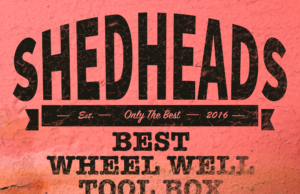 The pull handles are well made, the locks are secure, and the reinforced, weatherproof lid won’t bend easily, keeping your tools safe and sound. Next up is our first chest-style model. Chest style truck boxes ha ve their own unique set of benefits and drawbacks. It is more versatile in terms of what trucks it will fit, since it doesn’t need to be mounted on the bed rails, and instead sits directly on the floor of your truck bed. However, this does reduce the amount of floor space available in your bed (crossover models don’t usually hang all the way do the floor). If the space reduction of your truck bed doesn’t phase you, then read on! This chest doesn’t come with the plastic tray that the other models do, so you’ll have to find a different way to keep smaller items organized. black powder coat giving it a sleek matte black appearance. The black finish will look great mounted in the back your truck. The entire box is composed of aluminum, which is light weight and rust-resistant, providing you a box that should. Because this box is a Special Edition Crown version, it has the stainless steel pull handle, rather than the simply paddle style handles. These handles are higher quality and pair with the auto-lift shocks make it much easier to open. 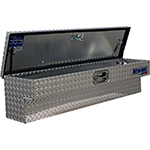 One major thing to consider with a truck chest is how you are going to mount it in your truck. You will need to decide this to make sure your tools stay safe. Simply putting the box in the back of your truck, filling it with tools and locking may deter some thieves simply because of the weight and difficulty to take the entire box, but it won’t stop all of them. For full security you’ll need to take the box off when not using, or bolt the box directly to your truck bed bulkhead or the floor. This may or may not require some drilling. In any case, the two-stage automotive grade latches will keep your tools locked up safely, and the rubber strip on the lid will keep your tools clean and dry. We’ve covered above some things to consider when installing a chest. If you’re set on chest style, just be aware it may require a little extra work to install. It is one of the best options for mid-sized trucks so it may be your best bet. The box is 48 inches wide which should fit even smaller trucks like a Ford Ranger, but as always, double check the measurements of your truck to be sure. You can see the exact measurements below. A chest style can be a great option, especially for folks with smaller trucks that want the same amount of storage as full-size crossover style modes. However, they can be a bit more of a headache to mount to your truck bed, so keep that in mind. But, you can use them with tonneau covers and canopies which is a huge plus! For a chest, this is a great option, mostly due to the the high quality aluminum, the sleek black powder coat finish. The latches, locks and handles make it a breeze to open and overall this is a good, affordable option. Side-mounted models are easily the most accessible option available, since you don’t need to hop in the back of your truck to get at any tools. The side-mounted version sits on the truck’s bed rail and also on the wheel well, allowing you to effortlessly reach in your truck to pull out whatever tool you need (if your truck is lifted, this may be a different story – keep that in mind). If you find yourself switching out what tools you need access to throughout the day, or maybe have bad knees and don’t want to be hopping in and out of your truck bed to fetch tools, a side-mounted may be the best option. It’s only 12 inches wide, so barely any of your bed space is taken up, so you can haul as usual. And, you can combine it another one, mounted on the opposite wheel well, and/or a crossover box for maximum storage. A small tray is included with this BetterBuilt to help keep your smaller tools neat and tidy. This storage unit is constructed from high quality unfinished aluminum. 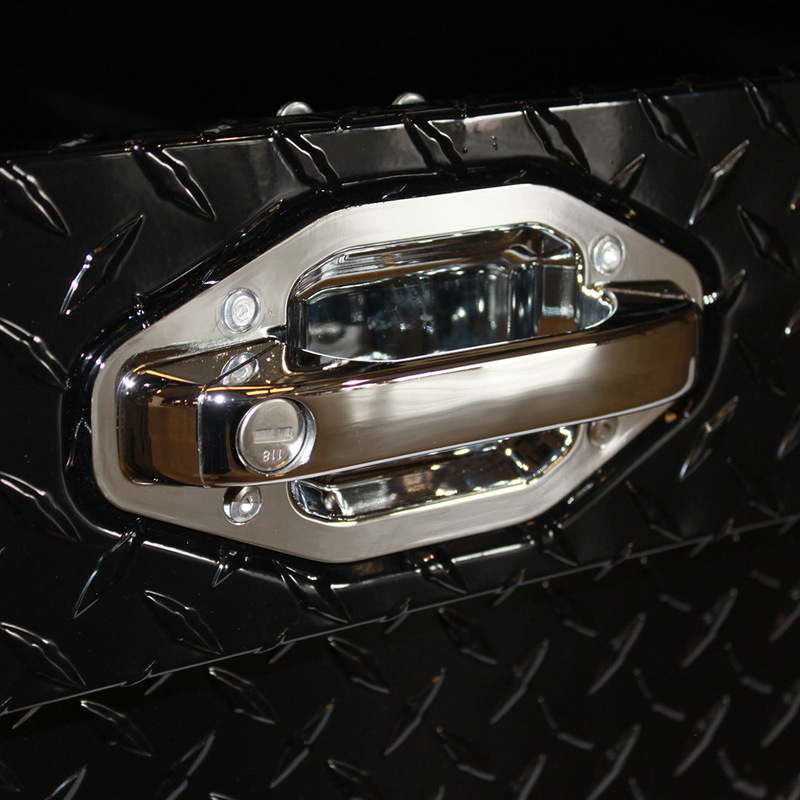 The diamond plate aluminum has a clean and shiny look to it, looks awesome mounted on a truck, and is also functional. There is no need for powder coating on aluminum because it is naturally rust resistant. 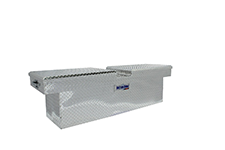 Because this side-mount tool box is the Special Edition Crown series, it has quality stainless steel pull handles, rather than basic paddle latches. 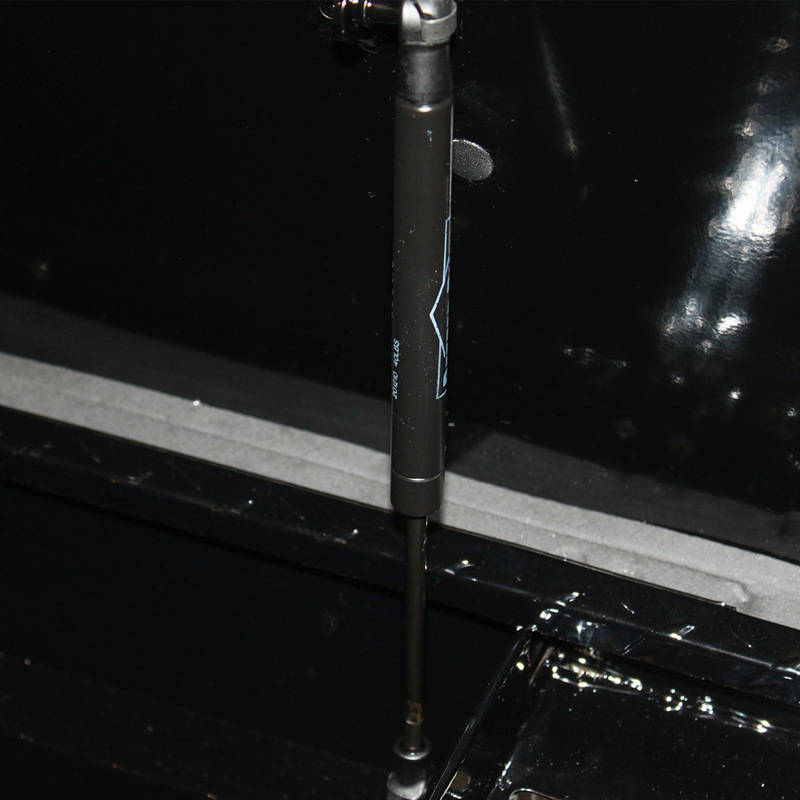 The aluminum piano hinge works effortlessly, and the auto-lift shocks make it easier to open the lid. 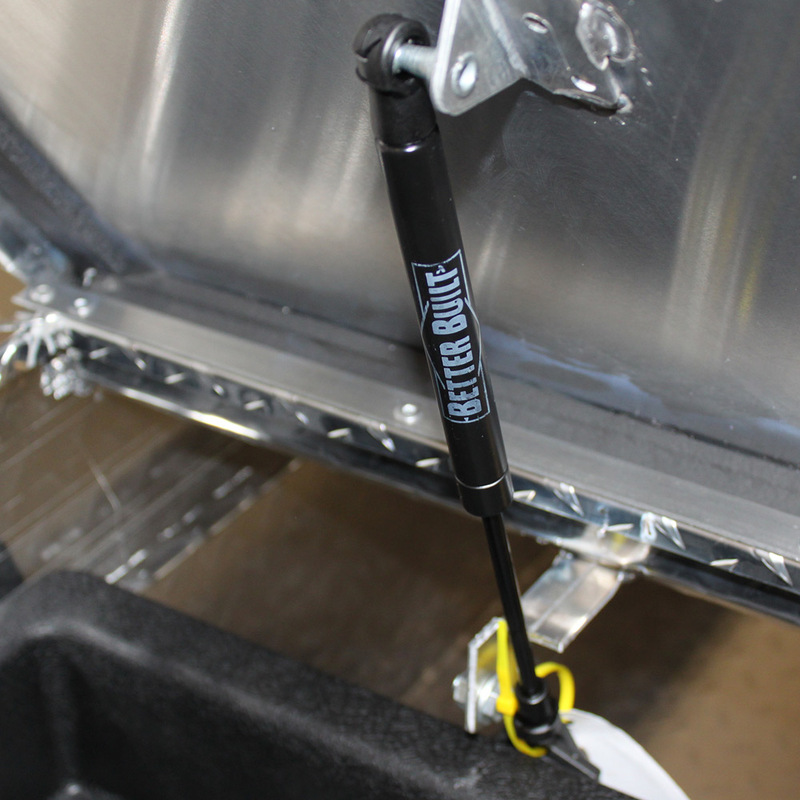 A single lockable stainless steel pull handle keeps your tools locked up safely. The Special Edition Crown standard 2-stage automotive grade rotary latch ensures safekeeping of your tools inside the box. The lid is reinforced for added strength and security. The edge of the lid is covered with a strip of rubber weatherproofing material. When closed, the rubber produces a seal with the aluminum of the tub of the box, keeping out water and dirt and maintaining a clean interior. Like all side-mounted boxes, this Better Built mounts partially on the wheel well of your truck, and partially on the bed rail. A simple bolt will be used to fasten the part of the box that sits on the bed rail, directly to the bed rail, no drilling required. Then, the back end of the box will sit on the wheel well, or hang directly overtop. If there is an empty space between the box and wheel well, you may want to shim it with wood or something else to prevent excess strain on your bed rails and the bolts. The measurements can be seen below. Double check the measurements of your truck to be sure! Like with the other models we’ve covered in this article, you are getting what you pay for. If you find yourself using your tools frequently throughout the day, switching out tools often from your truck, this may be a better option than a crossover model. 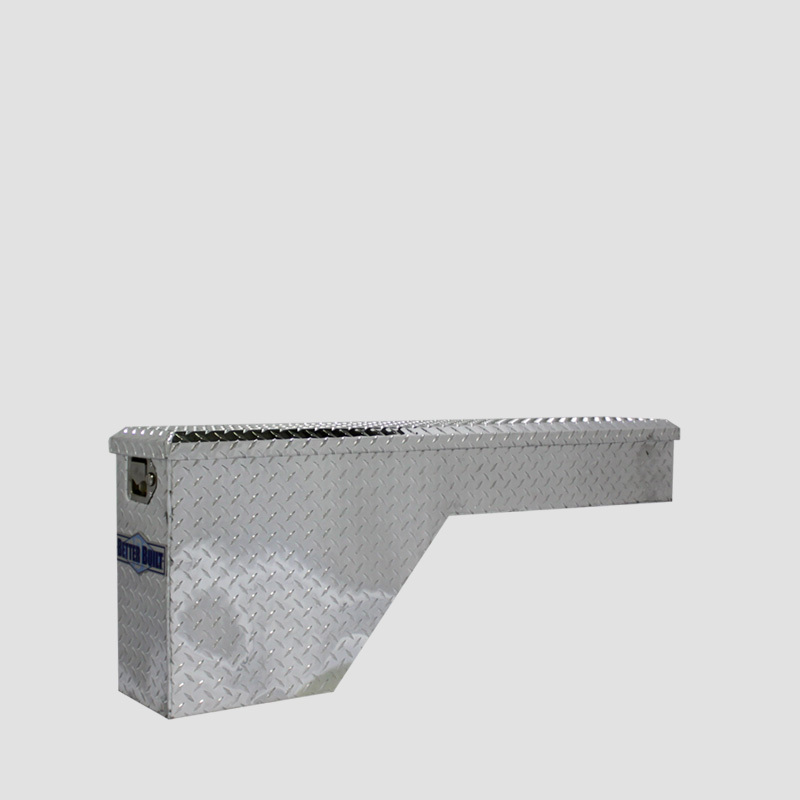 This side-mount tool box will allow you to get in and out of the box without hopping in the back of your truck. The lock and handle are well made, and the shiny unfinished aluminum looks great and won’t rust. This is very good affordable option for an aluminum side-mounted version. This Better Built tool box has a very unique and useful design. The wheel well storage solution is an genius way to add storage to your truck using a space that goes otherwise wasted – the empty space between your wheel well and tailgate. The (roughly) L-shaped box sits on the floor of your bed and wraps up onto the wheel well. It’s essentially universal and should fit almost every truck. A little piece of wood or other material shimmed underneath should help it fit if not and keep the box mounted level. 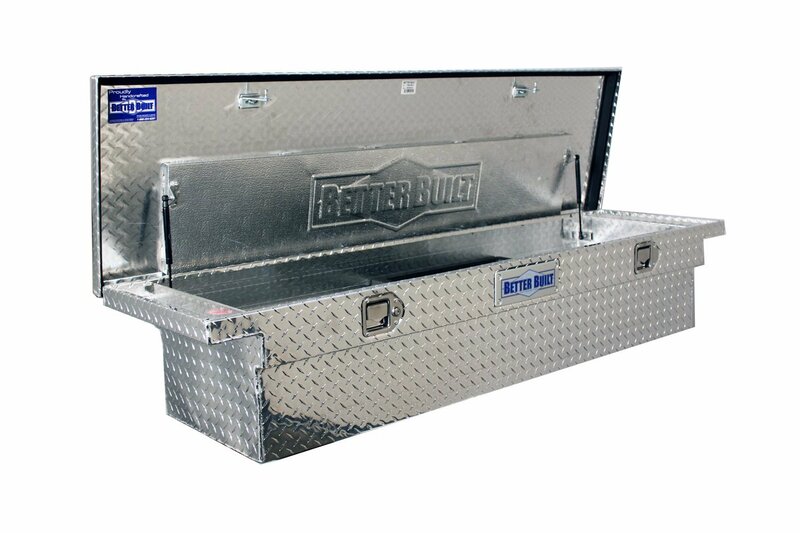 Depending on the height of your bed rails, this box makes a perfect companion for use with a tonneau cover, and you can mount it on either wheel well (or one on each). Depending on the angle of your canopy, it may also be used in tandem with a canopy as well. 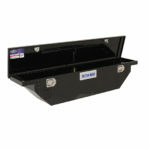 This wheel well style chest has a double static cam paddle handle that is lockable, to keep your tools safe from theft. There is a single auto-lift shock to make opening the lid much easier. The lid has the same rubber weatherstrip as the other Better Built boxes we’ve covered in this list. This BetterBuilt should fit almost all trucks with its universal design. Check out the exact measurements below. The hardware included to mount it is also not the best that that could be provided. They’re not stainless steel and so could rust, and they’re also small and flimsy. You may want to consider a different way to mount the box or pick up your own hardware. Did this article help you choose a storage solution for your vehicle? Let us know your questions or concerns in the comments below!